Skin is very useful. In addition to neatly separating self from other, it provides all kinds of feedback. Researchers from the University of Tokyo have devised pressure-sensor arrays that promise to give objects like rugs and robots the equivalent of one aspect of skin -- pressure sensitivity. The researchers' pressure sensor arrays are built from inexpensive organic, or plastic, transistors on a flexible material. This allows for dense arrays that can be used over large areas. The arrays could be used in pressure-sensitive coverings in hospitals, homes, gyms and cars to monitor people's health and performance, and eventually as skin that would give robots the means to interact more sensitively with their surroundings, said Takao Someya, an associate professor of electrical engineering at the University of Tokyo. The sensor skin works even when rolled around a cylinder as small as 4 millimeters in diameter, said Someya. The researchers' prototype is an eight-centimeter-square sheet containing a 32-by-32 array of organic sensors -- a density of 16 sensors per square centimeter. In contrast, humans have 1,500 pressure sensors per square centimeter in the fingertips, though far fewer in most other places. The pressure sensor arrays could be used in pressure carpets that distinguish family members from strangers or sense when a hospital patient collapses. The active-matrix design allows the arrays to be smart enough to enable specific sensors at certain feedback points to, for instance, monitor the heart and breathing rate of a hospital patient who has fallen to the floor, said Someya. The skin could measure whether an elderly patient is just taking a rest, or needs help, he said. Because organic transistor-based electronics are potentially very cheap, "it is not unrealistic to spread pressure carpets all over the floor in your house," said Someya. The skin could also be used in car seats to monitor drivers' mental and physical conditions, Someya said. "Our large-area pressure [sensing abilities] would be helpful" in obtaining information through drivers seats, he said. The skin could eventually be used to make domestic robots more appropriately sensitive of their surroundings, said Someya. "Robots working at home definitely require touch sensitivity," said Someya. This has proven difficult, he said. "It is not trivial matter to give a robot the ability to pick up an egg." A pressure-sensitive skin would be helpful in making robots that are capable of gently lifting a person or avoiding injuring people, said Someya. The prototype's pressure-sensitive rubber layer contains electrically conductive graphite particles that change the layer's electrical resistance when pressure is applied. This half-millimeter-thick layer and a copper electrode are laminated to an array of organic transistors. Because the pressure-sensitive layer and the electrode are unpatterned, only the transistor assembly requires alignment, making the manufacturing process relatively simple, according to Someya. The sensors are controlled by an active matrix that uses a transistor to record signals from each sensor in the array. The active matrix means that only one transistor is on for each stimulated sensor, which allows for lower power consumption and greater control than simpler pressure sensor arrays that wire sensors together in grids. This makes the pressure-sensitive skin appropriate for large-area sensor arrays, according to Someya. Organic transistors are considerably larger and slower than the silicon transistors used in most electronics, but they are also very cheap -- they can be manufactured using a printing process. Many groups of researchers are working to make speedier versions of organic transistors. The pressure-sensitive skin, however, is an appropriate application for today's relatively large and slow versions, said Someya. There is work to be done before the pressure-sensitive skin is ready for practical use, said Someya. The main challenge is making the organic transistors more reliable, he said. The electrical characteristics of organic transistors change in a matter of days, said Someya. To be practical, however, organic transistors should be stable for years, he said. 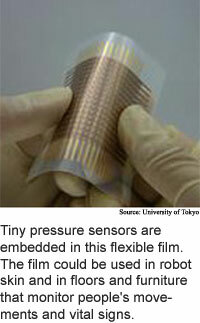 Electronic skin could be ready for practical use in four to five years, said Someya. Takao Someya's research colleagues were Tsuyoshi Sekitani, Shingo Iba, Yusaku Kato, Hiroshi Kawaguci, and Takayasu Sakurai. The work appeared in the July 6, 2004 issue of the Proceedings of the National Academy of Sciences (PNAS). The research was funded by the Japanese New Energy and Industrial Technology Development Organization (NEDO), the Japanese Ministry of Public Management, Home Affairs, Posts and Telecommunications, and the Japanese Ministry of Education, Culture, Sports, Science and Technology.